Wow!!! Thank you to Janette and her friends from England for the beautiful items so lovingly made and personally bought over by Janette and Rob. Thank you Rob for lugging that purple suitcase full of goodies to SA! Hope you had a wonderful holiday and arrived back in England Safe and sound. All funds raised will go towards supporting The Zoe Projects work with a focus on pregnancy support and maternal health care programs. 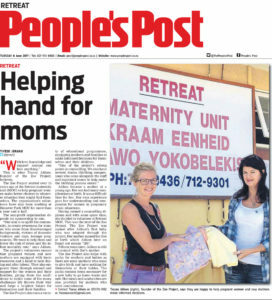 On behalf of all the women and babies that will benefit from your generous donations, we humbly thank you! Having a c-section makes you no less of a woman than having a vaginal birth. A big high five to all those mama's that have endured major abdominal surgery! 45 packs of maternity sanitary packs were donated by Liz Perryman’s very good friend Jackie Leeds, who lives in England.